At the weekend I went to a very, very nice hotel in the Costwolds to attend a wedding. What was even nicer was the incredibly swish and expensive hotel room, which came absolutely free. That was originally best thing about it, until I spotted the whisky cabinet down by the bar. 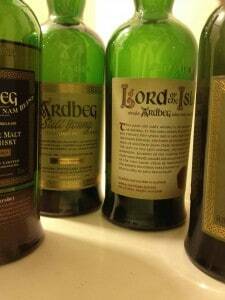 There, glowing as if lit by the gods, was a display of pretty hard-to-find Ardbeg whiskies. Among them was Ardbeg Lord of the Isles, which you can pick up today for around £650 a bottle. Given that few mortals can hand over such cash for a bottle, it remains out of reach for many of us. However, this hotel was charging a very reasonable rate for a dram. The accommodation was free, so it was rude not to spend just a little cash in order to try Ardbeg’s famous Lord of the Isles. When I seriously started getting into whiskies a few years ago, the Lord of the Isles especially appealed to me. I was a sucker for the unique design and a sucker for Islay whiskies. It was actually pretty inspiring stuff, too – you might say aspirational, and I would love to have owned a bottle. It was a bit of a dream dram. 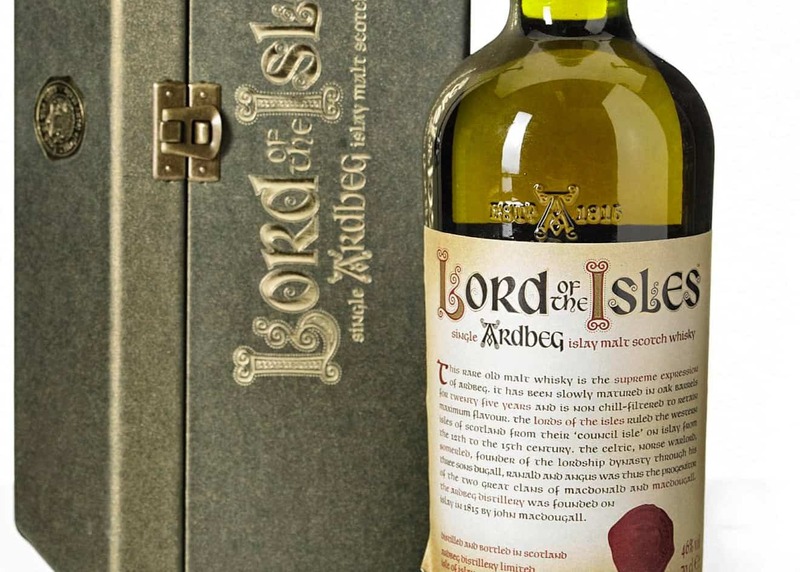 A 25 Year Old whisky, the Lord of the Isles was bottled at 46% ABV originally in 2001. If you were lucky enough to have one of these it would come in a green presentation box alongside a lovely scroll, no doubt containing some mystical bit of whisky lore. Anyway, I absconded with my glass of Lord of the Isles to a quiet room, and started making notes. Colour: amber, honey (I’m in a hotel room and the light is pretty poor, so I can’t be much more specific). On the nose: chocolate, caramel, peat, smoke, sherry, oak, vanilla… delightful. Elegant, for a big peaty whisky. In the mouth: big chewy stuff. Plums and redcurrants sit beneath a layer of lovely, light peat. The weight is not too heavy, not too light. Pepper. Warming oaky spice and a really long, dark chocolate and toast finish where all of these flavours just seem to echo into the distance. A good dram, then. 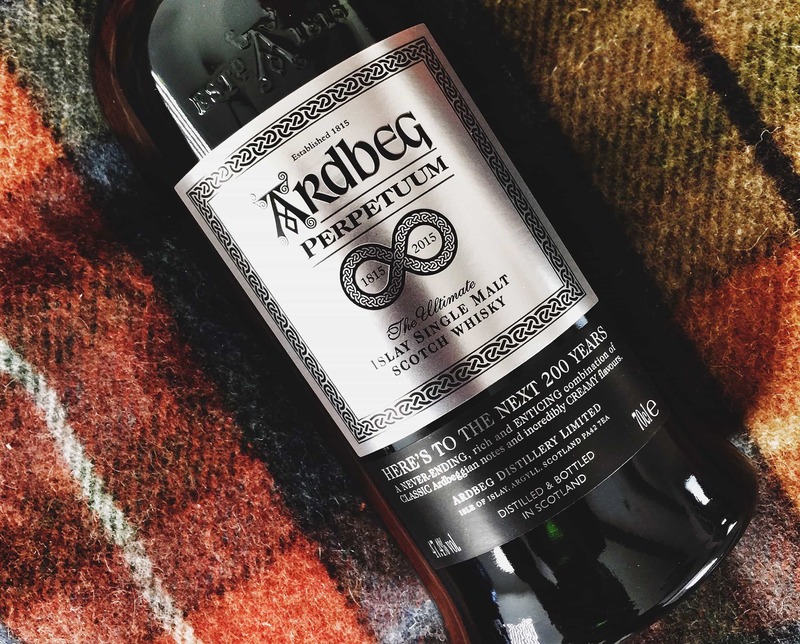 It’s not heady, knock-out stuff like the more recent Ardbeg releases. This is an Ardbeg quite suited to life in a country hotel. Quiet. Charming. Rich. Not the best, nor typical, example of an Ardbeg, but that’s not the point with whiskies like this is it? Dream drams are something else entirely. I would say personally that they’re not even for making tasting notes; rather they’re for making you feel smug that you’ve managed to corner quite an elusive and meaningful whisky. Some of the big whisky websites are funded by corporate groups. Others do paid-for content with brands. We don’t want to sell advertising. We don’t want to partner with brands. We don’t want to sell out, because we want to keep challenging the industry. But we could do with your support each month – think of it as buying us a dram. Read more about our new Patron offering, or hit the button below to contribute. I work as Head of Communications for Waterford Distillery and Renegade Rum Distillery. I've written about (and reviewed) whisky for Whisky Magazine, among other publications, and have been a whisky judge for competitions including the World Whiskies Awards. I've done other writing too: several mass market genre novels, a few short stories, including for BBC Radio 4. Follow me on Instagram.com/maltreview/ or Twitter.com/MaltReview. Wow… GBP 650 per bottle… that’s crazy… Luckily I still have an unopened bottle here. Thanks for that nice review. An unopened one? I’m jealous! Yeah, the prices seem to range from about £500-700, but the Whisky Exchange seems dependable enough for me. Now 5 years later I bought a bottle in the box in Holland at € 1095, that would be around £ 950. © 2019 Malt Made with love by Pixelgrade.